Of the 1,712 degrees being conferred this year, 325 will be master’s degrees, 986 will be bachelor’s degrees and 382 associate’s degrees, along with 19 certificates. Those degrees will be awarded at college convocation ceremonies to be held Saturday afternoon and evening, where students will individually be awarded their diplomas. Among the graduates is Alex Nielson, a biology major and chemistry minor from Holladay, Utah, and SUU’s 2016 Valedictorian. The Class of 2016 features students from 34 states, one U.S. Territory and 16 countries. There are 959 females and 753 males, along with 48 married couples who will celebrate together. The graduates range in age from 17 to 69 years old. The University will also present four honorary doctorate degrees during the University Commencement. President Yushchenko will receive an honorary doctorate in public service, while his wife Kateryna, will receive an honorary doctorate in humane letters. Honorary doctorates in public service will also be awarded former SUU Board of Trustee and Utah 6th District Judge Kay L. McIff and Mark Russell, former SUU National Alumni Board president. The University Commencement will feature remarks from SUU President Scott L Wyatt, along with the Class of 2016 student speaker, Andie Marie Szekely, a technical theatre and design major from Las Vegas, Nev.
All SUU's graduation ceremonies and festivities are free and do not require tickets, with general admission seating. 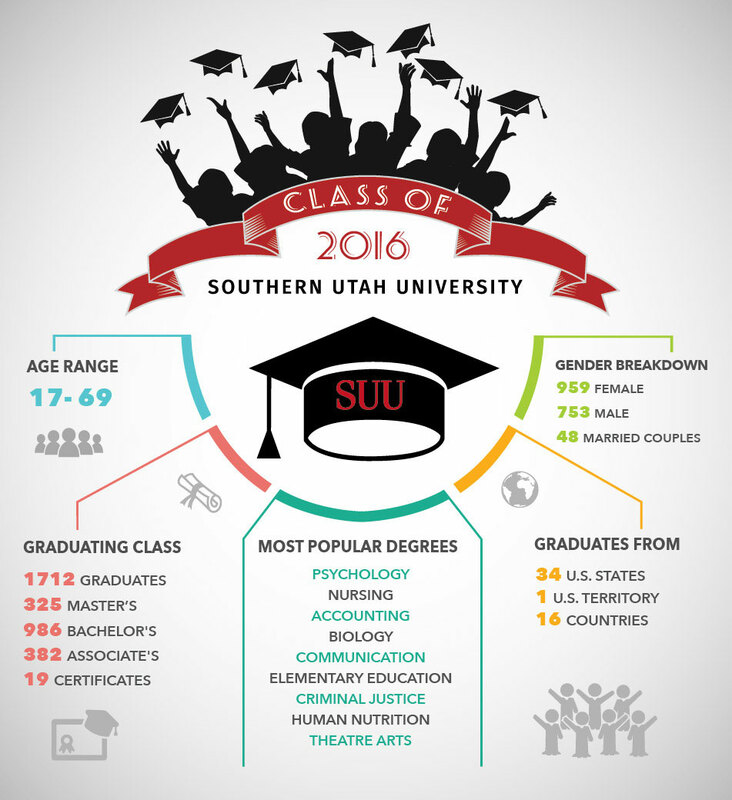 For additional information about all of this year’s graduation festivities, please visit suu.edu/graduation.